Do you want the absolute best for your family and our Perry County community? So do we. If you believe, as we do, that working together is the best way to create a better Perry County, then we invite you to be part of our local KFTC chapter. We are a diverse group of Perry Countians – teachers, retired coal miners, students, unemployed, moms, grandparents and many more. We work together – as we have for 30 years – to protect our water and land, bring new energy and new jobs to our area, share our vision with elected officials and make sure Perry County is a safe place to call home for everyone. We support each other, have fun and get things done. Come join us at our next potluck chapter meeting! The Foot Prints for Peace march, which protests mountaintop removal mining and promotes a sustainable future, is a 200-mile march from Prestonsburg to Frankfort and ends at I love Mountains Day each year. We were treated very nice this year by residents along the march route. 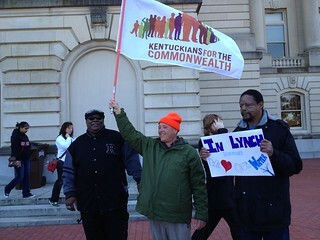 The marchers were interviewed by Lexington Channels 57, 27 and channel 18 along the way. 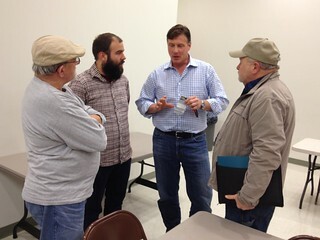 Just days before traveling back to Frankfort for the two upcoming months of General Assembly, new Senate Majority Whip Brandon Smith met up with KFTC members at the Perry County Library. This was one of several at-home meetings KFTC members organized this past week to open up communication during this General Assembly as well as to build support for the Clean Energy Opportunity Act. Members from Perry County, Harlan County, and Letcher County met with Sen. Smith about this legislative priority as well as the Kentucky Voting Rights Amendment (HB 70) and other local issues. 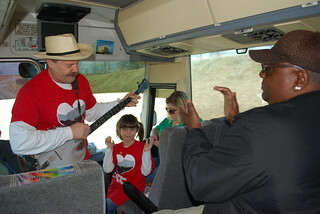 Ride the Big Bus from East KY to Frankfort for I Love Mountains Day! Despite snowy roads and widespread sickness, over a dozen east Kentucky members attended a Citizen Lobby Training at Hindman Settlement School this past weekend. The training brought out folks from 5 counties, some with decades of lobbying experience along with people who’ve never lobbied or never even been to Frankfort. Long time member Patty Amburgey, of Letcher County, shared several experiences and pointers from her years of lobbying in Frankfort. "KFTC empowers residents to bring about positive changes in their communities. It gives members confidence that they can make a difference. You are not one person, but part of a statewide organization of thousands supporting you and your cause." Join us on the 3rd Monday of every other month at 6 p.m. for the Perry County chapter meeting. We rotate meeting locations so please check the KFTC calendar for most up to date meeting information. Chapter meetings are a great time to plan local work, discuss local and statewide work, meet new people, and much more. Everyone is welcome and invited to attend! Hope to see you there! The Perry County chapter will be moving its meetings to the *fourth* monday of every month.